Where to start? So as this site is dedicated to Old Geeks everywhere, who have a ponchant for Sci-Fi it only seems fitting that the first article I write is about the up an coming film Rogue One. So am I excited - "Hell Yeh", Have I booked a day off work - "definitely". Whats so exciting .... "It's Star Wars!!!". We are simple fools who want to be entertained - so this is how this site will view the film and up and coming posts. No slamming, No hating, just gushing. Great word gushing it reminds me of an out pouring of love, which if you think about it is what being a Geek means, young or old, good or bad, our love of Sci-Fi keeps us sane. IMDB describes the upcoming film storyline as - "Jyn Erso, a Rebellion soldier and criminal, is about to experience her biggest challenge yet when Mon Mothma sets her out on a mission to steal the plans for the Death Star. With help from the Rebels, a master swordsman, and non-allied forces, Jyn will be in for something bigger than she thinks." - IMDB. Find his review of the trailer at StarWars.com. I can see why he is excited, the mix of clone wars, book characters and original plot line must make an old Sci-fi geek gush (ahh there it is - gush). What more can you ask for, Vader - I say again Vader! Its all you need to know to get your tickets booked. Oh and stormtroopers - yes original troopers, its enough to make three-pio blow a gasket. So here we go let the countdown begin and let the inner child out. Geek out. Need to get up to date? Read The Star Wars Reports Blog on getting up to speed on www.starwarsreport.com Trust me you won't regret it. 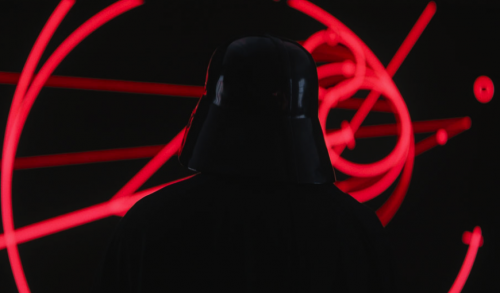 So hang on from the new Trailer Jyn's father is the death star designer!!! Well this is going to be interesting. Did you see the X-Wing battle, my geek juices are gushing. Geek out.